TVS Racing, the motorsport division of the TVS Motor Company, has announced the dates for the selection rounds of the 2019 edition of the Ladies One Make Championship. These rounds that will pick a grid of women racers to take part in the all-women championship will take place on February 9 in Bangalore, and February 23 in Mumbai. The Bangalore selections will be held at Meco Kartopia in Hennur and the Mumbai selection at the iLand Sports go-kart track in Wadala. The 15 best riders will be selected from each city, based on their lap timings, physical fitness and racing abilities. 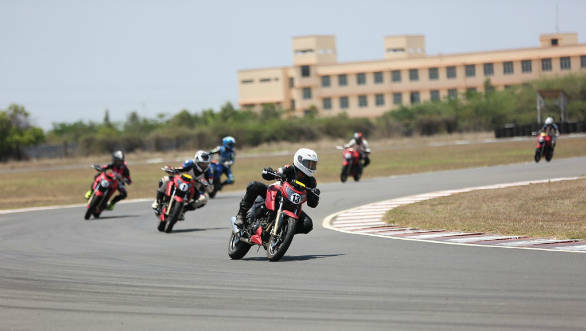 The final selection from amongst these 30 riders will happen in Chennai at the Madras Motor Race Track (MMRT) on May 4. After this, the selected riders will undergo more training to improve physical fitness and racing skills under the guidance of TVS Racing's national champion riders. Eventually, they will compete in five rounds of the championship on a fleet of TVS Apache RTR 200 4V Race Edition 2.0 motorcycles, starting in June. The ladies will also have access to this motorcycle during the selection rounds to familiarise themselves with it. Commenting on the Ladies One Make Championship, B Selvaraj, team manager of TVS Racing said, "We are the only manufacturer in India committed to women racing with four consecutive seasons of the TVS Ladies One Make Championship. We introduced this initiative to train and equip talented women riders to enter the mainstream racing arena. With each passing year, I am delighted to see the increasing number of participants, which is a testimony to our effort of creating a gender-neutral space for motorsports in India. I wish all the women participants the very best and hope to see them excited about professional racing."